Do you like grits? I do. I love them plain with a little butter and sugar for breakfast. Creamy grits on the stove top make me happy. 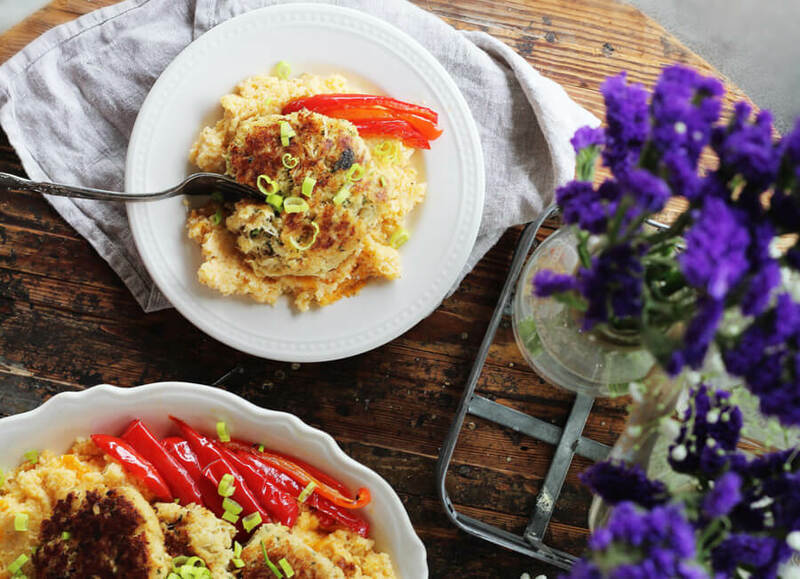 But I have found a new Southern love: this Baked Cheddar Cheese Grits Recipe. I recently visited New Orleans, and one of my favorite meals on my trip? Tender crab cakes served with cheesy grits. 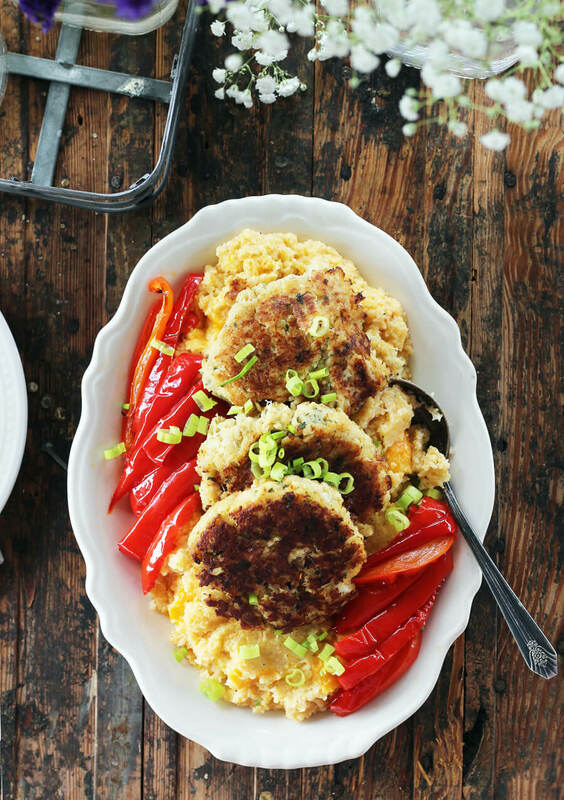 We used a couple of easy time savers to help us with this indulgent recipe that features savory cheese grits, yummy crab cakes and roasted bell peppers. 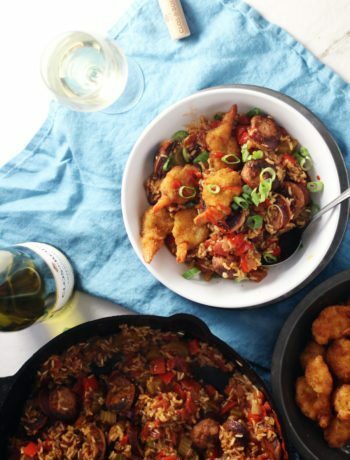 This recipe is inspired by my recent visit to foodie heaven: New Orleans. I’ve been working on a cheese grits recipe for a while now, because one of my favorite meals on my trip was Crab Cakes served over Cheese Grits. After my last trip to another foodie heaven, The Fresh Market grocery store, I knew it was time to share my cheese grits recipe. I picked up freshly prepared Ultimate Lump Crab Cakes and made a beeline straight to my kitchen to start the grits. Whether it’s sautéed in cakes, served in a salad or cracked open and doused in butter, crab is always a treat worth celebrating. Visit your neighborhood The Fresh Market September 5 – October 2 to enjoy savings on Crab Cakes, Wild Snow Crab Leg Clusters and Wild Jumbo Soft Shell Blue Crab (limited supply – get ‘em while they last!). My flower selection. Natural and so pretty, I could not resist. 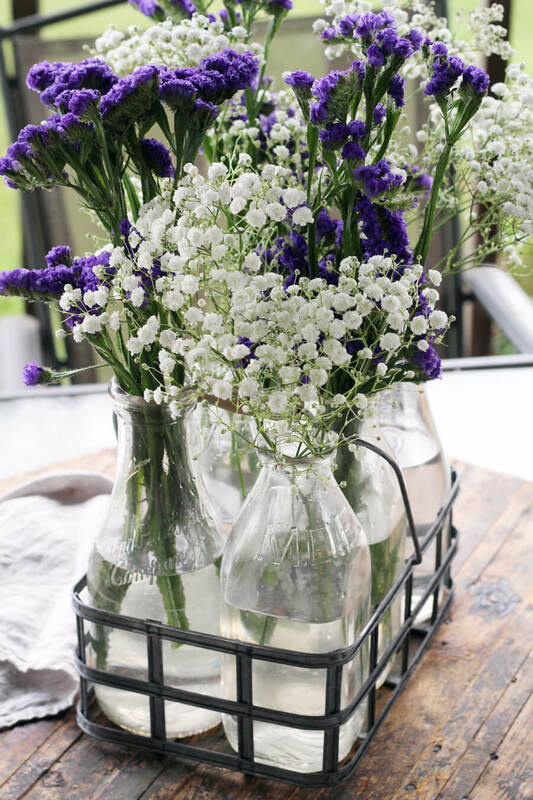 I spend so much time in my kitchen, and gorgeous flowers make my time there more enjoyable. So what the heck is a “grit”? I’ve grown up eating grits all of my life. Some people love them, some people choose to pass. Grits are very coarsely ground corn with a “gritty” texture. The history of grits starts in the Southeastern United States when Native American tribes would grind corn on a stone until it was a gritty, meal-like texture. Even to this day, the tradition of grits is strong down here. Over 75% of all grits are sold in the South. Which leads me to believe that over 75% of all grits are also eaten in the South. Grit math. Instant Grits – This type of grits has already been cooked then dehyrated. This grit cooks the fastest, and I am not a fan. They don’t have much flavor in them at all. Next! 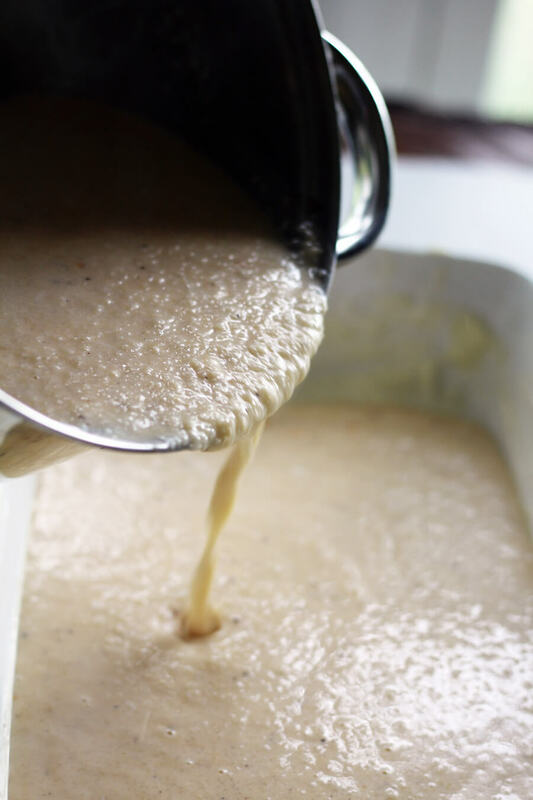 Quick Grits – Quick grits are typically made from white hominy grits and have been soaked with a solution to soften the outer hull, then rinsed to remove the tough part. I find that these grits are less “gritty” and are a great all-around grit to have in the pantry for convenience. Regular Grits – Same as quick grits, but they have a medium-grain texture. They take a little longer to cook than quick grits, and are delicious. I love the texture. Old Fashioned Grits – These are my favorite. The texture isn’t for everyone, but old fashioned grits are stone-ground and have a coarse texture. They often are speckled in color and have a chewier mouth feel. Stone Ground Grits – Same as Old Fashioned, although you will find more corn varieties used on products labeled stone ground (blue corn, etc). Hominy Grits – Most grits are hominy grits. White hominy corn has a type of starch in it that cooks up creamier than yellow corn. Instant grits, quick grits, regular grits, and most old fashioned grits are all made from hominy. Yellow Grits – This type of grit is ground from yellow corn. The flavor is sweeter and …well…cornier. Next time, I’ll be trying our cheese grits recipe with these. The type of starch is different than in hominy, so they aren’t quite as creamy. 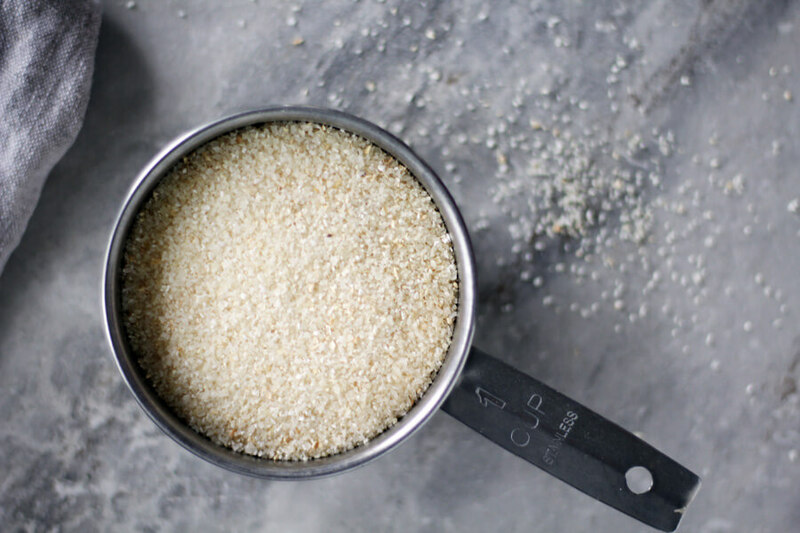 Don’t confuse grits with cornmeal or polenta. Although they are all derived from corn, there are differences in texture, process, and variety of corn. My goal with this recipe was for it to be bold, rich and savory. The last thing I wanted to pair with my crab cakes was bland grits. Here’s what you will need to pick up while you are at The Fresh Market. Get the exact amounts and recipe at the bottom of this post. White hominy grits – You can use old fashioned (longer cooking) or quick grits (faster) for this recipe. I’ll give you different prep instructions for either. Chicken broth – Using chicken broth in the cooking liquid instead of plain water adds depth to this recipe. Whole milk – Grab whole milk for a creamy texture. Water – Grits take a lot of liquid, let me tell ya’. Salted butter – We picked up European style butter at TFM because of the rich creaminess. You can use your favorite brand. Cheddar cheese – Yes, I was looking for a reason to hang out at the gourmet cheese counter. For this recipe, we used two types of cheddar: a sharp yellow cheddar and New York style white cheddar. 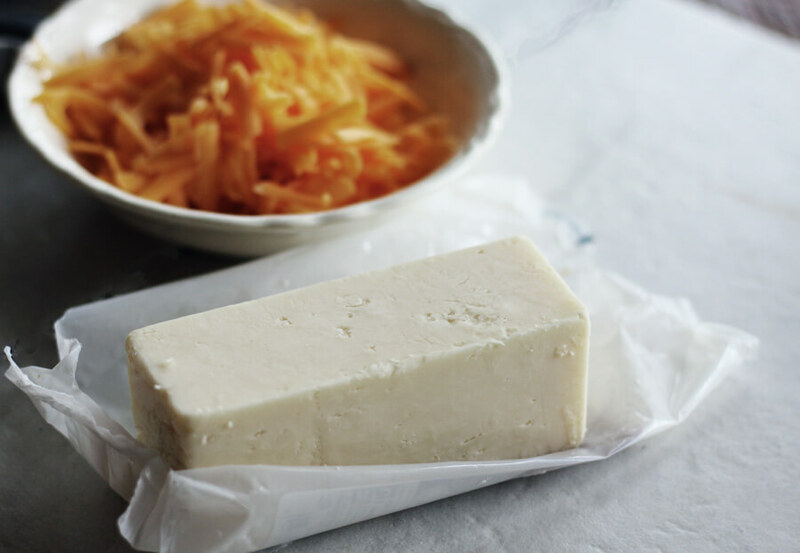 Use a high quality cheese for the best flavor. If you skimp on cheese, you will taste the difference. Splurge, baby! Egg – Since we are baking this cheese grits recipe into a casserole type dish, egg adds a richness of flavor and helps the grits set up. Garlic – Oh yeah. Nothing boring about these grits, ya’ll. Seasonings – Hot sauce, salt and black pepper. 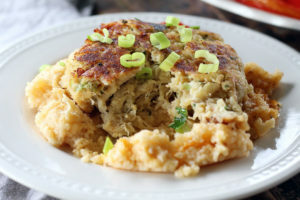 To prepare Baked Cheddar Cheese Grits to serve with your crab cakes (no worries, we are about to get back to the crab! ), whisk together the chicken broth, milk, water, butter, and garlic in a large pot over medium-low heat. You don’t want it to boil, just bring it to a nice simmer. The garlic and butter add so much flavor to the base of these grits. Once the mixture is hot, stir in the grits. Cook and stir the grits until the mixture thickens. For quick grits, whisk and cook for about 7 minutes. For regular grits, about 15 minutes. For other varieties of grits, about 20. This part is not super critical, because the grits will finish absorbing water when they bake in the oven. The mixture will be like a thick soup. You want to keep whisking almost constantly to release the starches so the end result will be creamy. 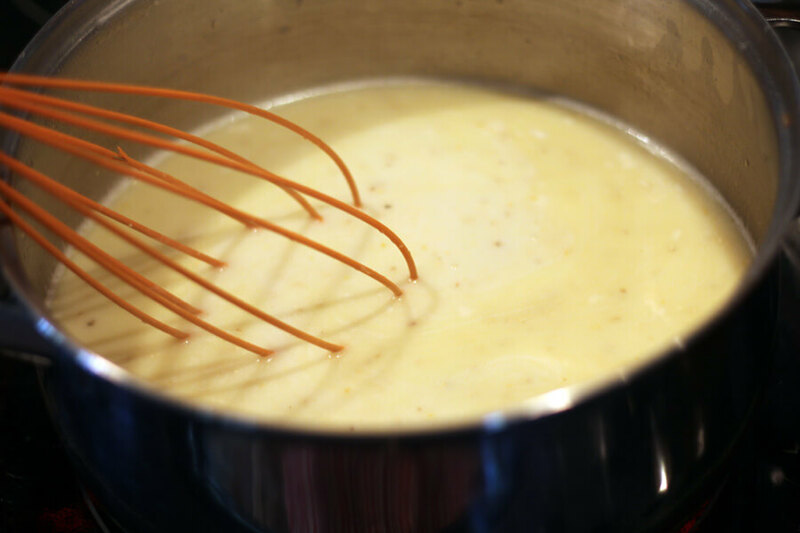 Remove the grits from the heat and quickly stir in the egg mixture (see recipe at bottom of this post). Fold in both types of gourmet cheddar cheese. Then pour the cheesy grit mixture into a buttered casserole dish. Now it is magic time! Bake the grits uncovered in a preheated oven. For quick grits, bake for 30 minutes. For regular grits, 45. Sprinkle with more cheddar cheese and broil for a minute or two until the top layer of cheese is golden and bubbly. Gah, is there anything more wonderful than melted cheese?! Yes, there is. Melted cheese on these grits. Look at these grits!! The grits and starches have melded with the egg, butter, milk and cheddar to create this heavenly + savory Southern dish that is the perfect companion for our Ultimate Lump Crab Cakes. Crab Cakes make me Happy! I love a great crab cake. Any time I travel anywhere that offers housemade crab cakes on their menu, that’s what I am ordering. The Fresh Market makes their own, and they are perfect. Savory, tender and just the right amount of spice. Ultimate Lump Crab Cakes are made with 80% lump crab meat and simple ingredients that enhance the delicate flavor of the crab. 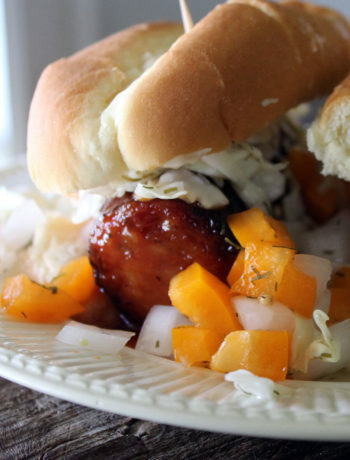 No filler, no fluff—just pure, meaty goodness! For a limited time, get two Ultimate Lump Crab Cakes for $10 as part of the Crab Bash celebration. 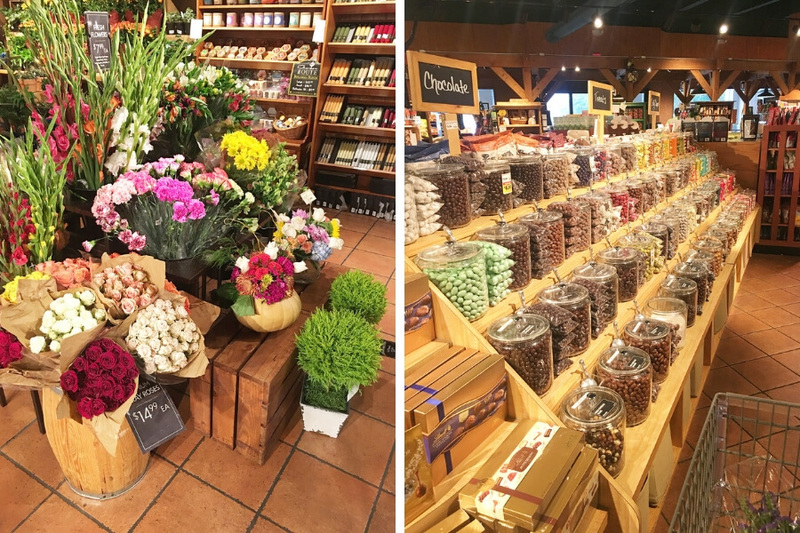 Plus, The Fresh Market is a true foodie destination place to shop, especially when you are entertaining, want to impress (date night!) or treat yourself. Click here to learn more about the Crab Bash, get more cooking tips and inspiration! Above is how they come packaged. They take just a few minutes to prepare, which saves me a lot of time and effort. Refer to the cooking instructions on the label. Me? I opted for pan frying them in more of that yummy butter. You can’t go wrong with any of the crab cakes from The Fresh Market. 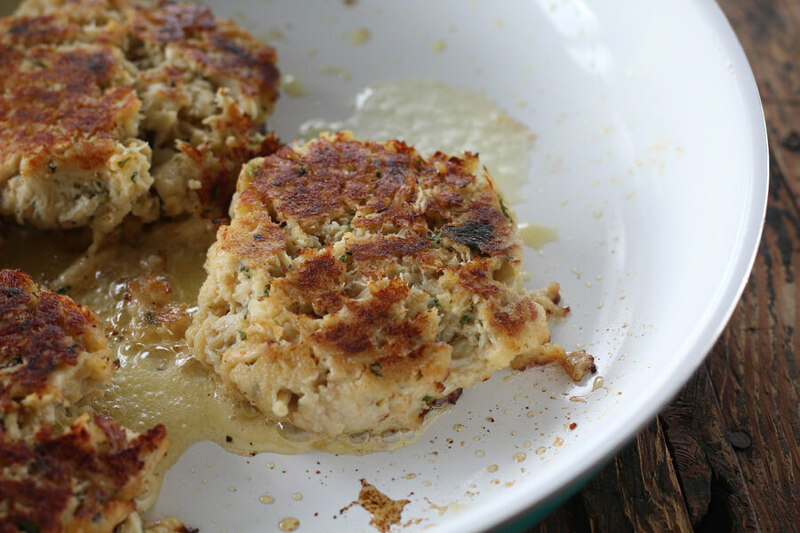 These crab cakes are filled with tender, succulent meat, so each bite is consistently satisfying and full of flavor. They are tender and flaky, and perfect on top of a cheesy bed of our homemade baked grits. 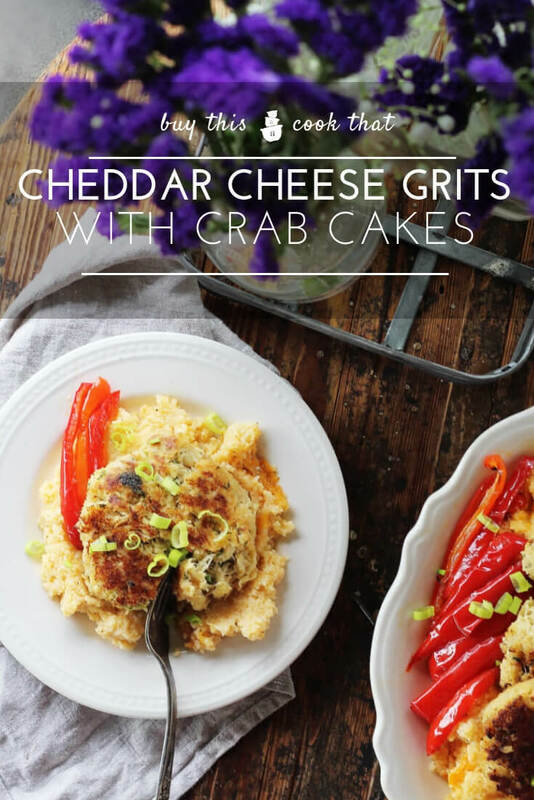 Serving Suggestion: Arrange the crab cakes on a platter of cheese grits. Serve with roasted red bell pepper strips and sprinkle with chopped green onions. The fresh vegetables add a pop of color and flavor to this indulgent dish. If this doesn’t make your mouth water, then we need to talk. 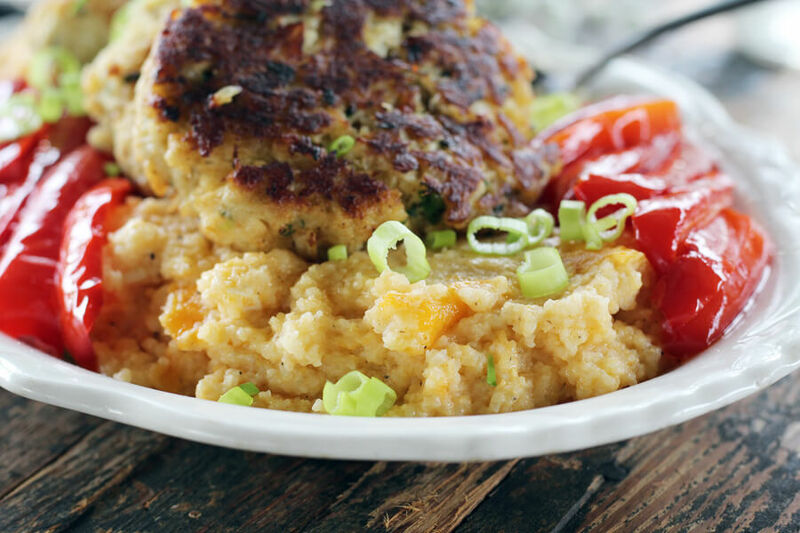 Creamy and cheesy grits with just the right amount of texture, blended with two types of cheddar cheese and garlic…topped with succulent, meaty crab cakes. I’m going back to New Orleans right in my own kitchen! 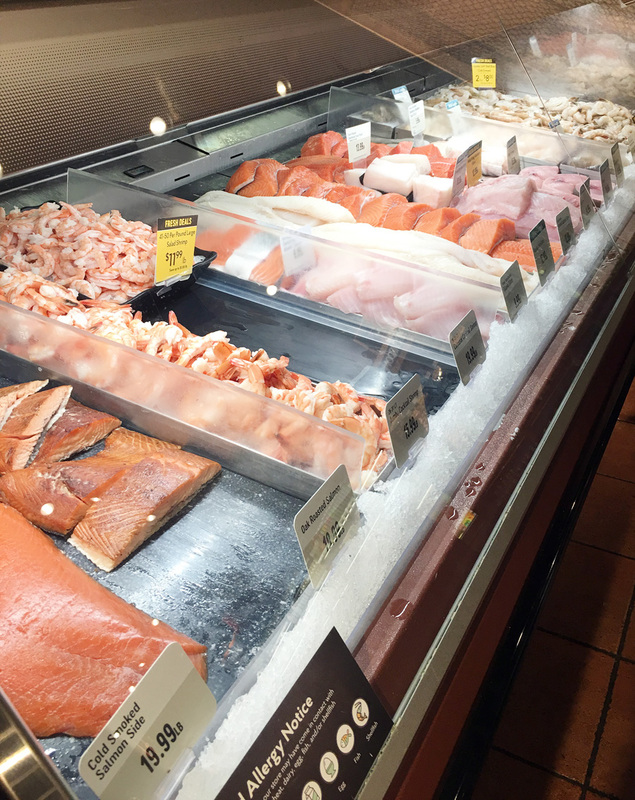 Get more Crab Bash ideas from The Fresh Market – CLICK HERE! My Southern roots are showing with this savory recipe for Baked Cheddar Cheese Grits. 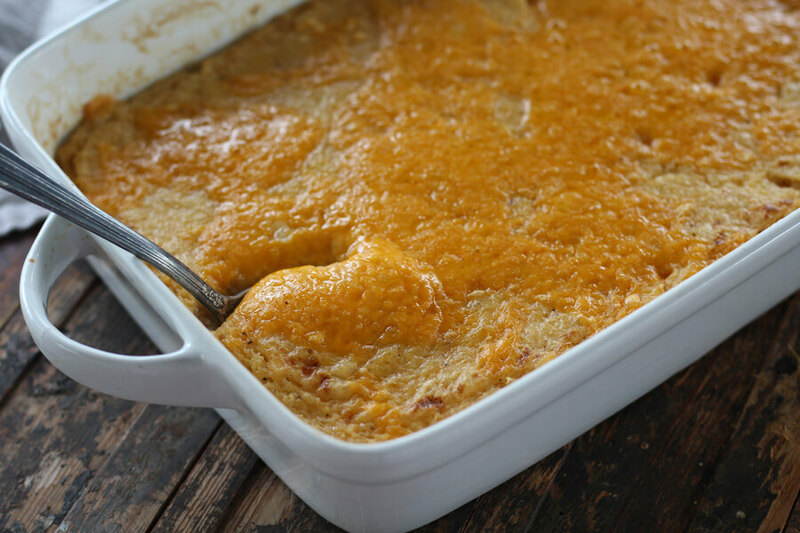 This easy grits casserole is made with two types of gourmet cheddar cheese, fresh garlic, butter and chicken stock to give amazing flavor to a staple Southern dish. Served along with tender lump crab cakes and roasted red bell peppers. Preheat oven to 350 degrees. Butter an 8x11 baking dish with two tablespoons of the butter. Set aside. In a large sauce pan, whisk together the chicken broth, 1 cup of the milk, and the water. Stir in the remaining butter, minced garlic and sea salt. Heat over medium low to a simmer, stirring frequently. Once the liquid mixture has come to a simmer, whisk in the grits. Whisk almost constantly until the mixture thickens. For quick grits = about 5 - 7 minutes. For regular grits = about 15 minutes. For old fashioned grits = about 20 minutes. The mixture will be soupy and not very thick. Remove the grits from heat. In a small bowl, whisk the egg, remaining milk, hot sauce and black pepper together until smooth. Whisk the egg mixture into the grits. Stir in one cup of each type of cheese, reserving some for the top. Pour the cheese grits into the prepared buttered baking dish. Bake in the preheated oven. For quick grits = 30 minutes. For regular grits = 45 minutes. For old fashioned grits = about 50 minutes or more, test them for doneness. Sprinkle the remaining cheese on top and return to the broiler for a few minutes until the cheese is melted and bubbly. Remove from the oven and let stand 5 minutes before serving. While the cheese grits recipe is baking, prepare the pepper strips by tossing them in the olive oil. Bake in a separate small baking dish along side the grits until the peppers are tender. Set aside until serving. Prepare the crab cakes according to package directions. Keep warm until serving. To serve family style, create a bed of cheese grits on a large platter. Top the grits with the prepared crab cakes. Serve along with the roasted red peppers and sprinkle the chopped green onion over the top. Serve warm! 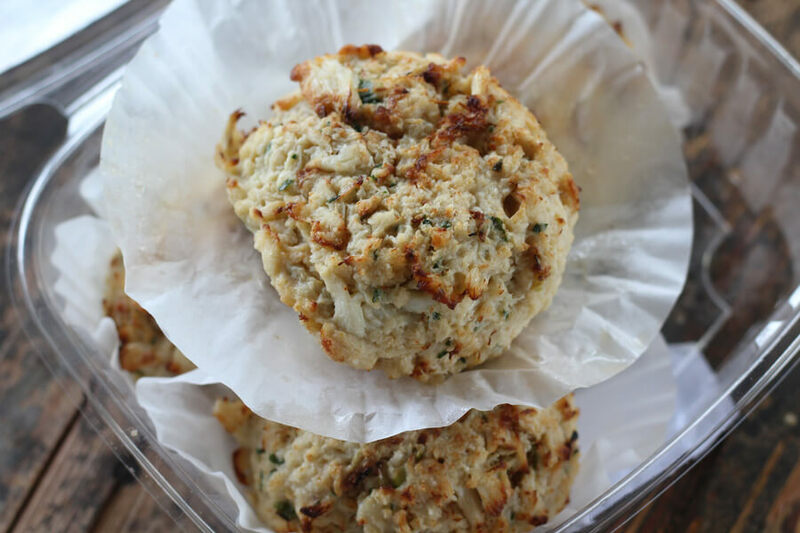 Due to variations in crab cake ingredients and size, the nutrional value for this recipe is estimated based on 4 jumbo lump crab cakes prepared traditionally. 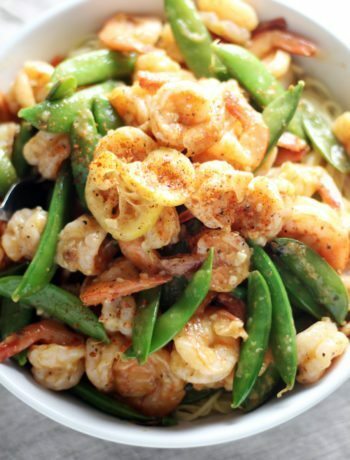 Easy Lemon Garlic Shrimp. You’re Welcome.